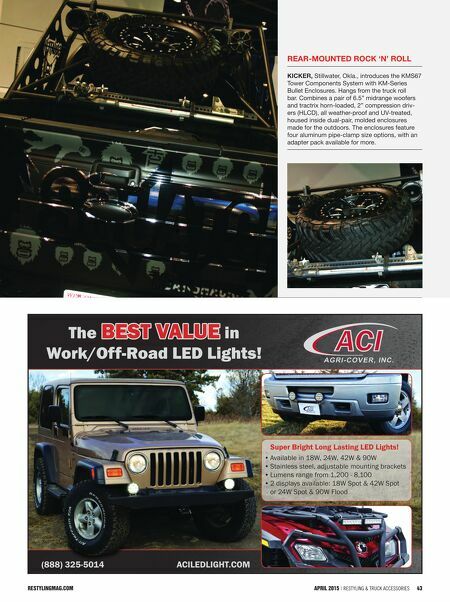 42 Restyling & tRuck AccessoRies | April 2015 restylingmAg.com Tell them you saw their product in Restyling & Truck Accessories Magazine! Wheel Well Truck Box Du-hA Inc., Fergus Falls, Minn., features the DU-HA Humpstor. The all-in-one storage unit, toolbox, and gun case mounts in the bed of trucks over the wheel well. Fits underneath most ton- neau and roll-up covers. No-drill installation, as it clamps securely to the lip of the existing bed rail. 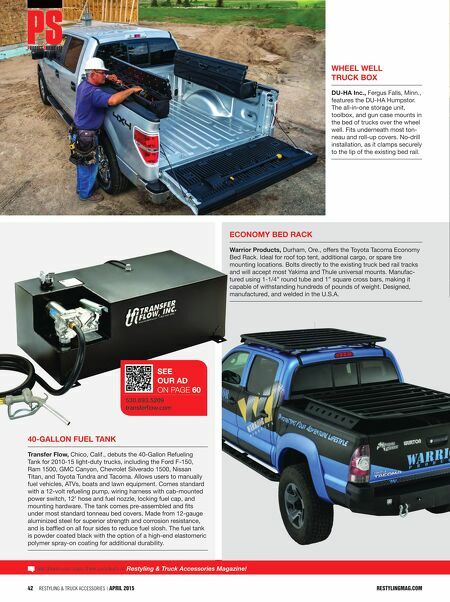 40-GAllon Fuel TAnk Transfer Flow, Chico, Calif., debuts the 40-Gallon Refueling Tank for 2010-15 light-duty trucks, including the Ford F-150, Ram 1500, GMC Canyon, Chevrolet Silverado 1500, Nissan Titan, and Toyota Tundra and Tacoma. Allows users to manually fuel vehicles, ATVs, boats and lawn equipment. Comes standard with a 12-volt refueling pump, wiring harness with cab-mounted power switch, 12' hose and fuel nozzle, locking fuel cap, and mounting hardware. The tank comes pre-assembled and fits under most standard tonneau bed covers. Made from 12-gauge aluminized steel for superior strength and corrosion resistance, and is baffled on all four sides to reduce fuel slosh. The fuel tank is powder coated black with the option of a high-end elastomeric polymer spray-on coating for additional durability. 530.893.5209 transferflow.com See our AD On page 60 economy BeD rAck Warrior Products, Durham, Ore., offers the Toyota Tacoma Economy Bed Rack. Ideal for roof top tent, additional cargo, or spare tire mounting locations. Bolts directly to the existing truck bed rail tracks and will accept most Yakima and Thule universal mounts. Manufac- tured using 1-1/4" round tube and 1" square cross bars, making it capable of withstanding hundreds of pounds of weight. Designed, manufactured, and welded in the U.S.A.